Meine Dissertation steht für Interessierte hier zur Verfügung. Dialogic Online-PR. Short Abstract of My Dissertation in English. A few weeks ago I posted a summary of my dissertation in German here and the University of Vienna just published the full PDF here. Having translated the initial and final models into English today, I thought it would be neat to have a synopsis including these two illustrations. Dialogic online-PR is a strategic and process-driven method of public relations which aims at establishing a two-way, symmetric and open outcome flow of communication through online tools. 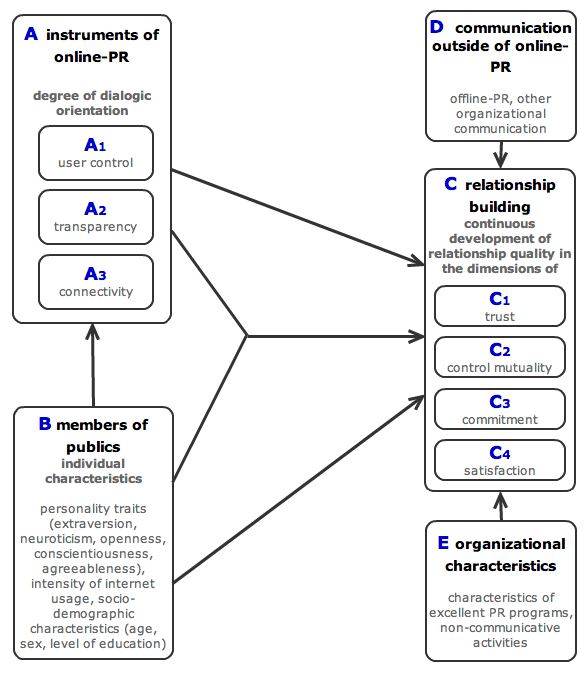 The model of dialogic online-PR is based on the excellence studies by James Grunig et al, which indicate that building relationships is the essence and goal of public relations. Relationship quality, which can be measured by focusing on the core components of relationships (control mutuality, trust, commitment, satisfaction), is the main dependent variable in the model. The instruments of online-PR can be distinguished by their degree of dialogic orientation. The index of dialogic orientation (IDO), which has been developed within this doctoral thesis, allows attributing a level of dialogic orientation (no, little, medium and high dialogic orientation) to online tools. The index comprises three structural dimensions: (a) user control, (b) transparency, and (c) connectivity. 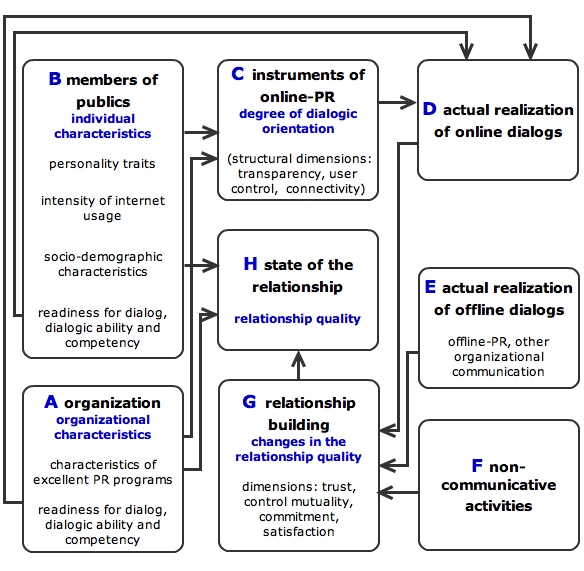 The dialogic orientation of instruments of online-PR is considered as the main independent variable in the model. Through empirical research, it has been found that a number of variables (individual factors like personality traits and socio-demographic characteristics) are related to the degree of dialogic orientation and partly to relationship quality. However, the results of the study indicate that there is no direct linkage between the degree of dialogic orientation when using online tools and relationship quality. These findings lead to the conceptualization of an adapted model of dialogic online-PR. This final model, which represents the research findings of this doctoral thesis, was derived from the original model by incorporating elements of Andreas Mann‟s theory of dialogic marketing. The variables readiness for dialog, dialogic competence and actual realization of dialogs were added to the model. Burkart, Roland (2005): Verständigungsorientierte Öffentlichkeitsarbeit. Ein Konzept für Public Relations unter den Bedingungen moderner Konfliktgesellschaften. In: Bentele, Günter/Fröhlich, Romy/Szyszka, Peter (Hg. ): Handbuch Public Relations. Wissenschaftliche Grundlagen und berufliches Handeln. Wiesbaden: VS-Verlag, S. 223-240. Grunig, Larissa A. / Grunig, James E. / Dozier, David M. (2002): Excellent Public Relations and Effective Organizations: A Study of Communication Management in Three Countries (Lea’s Communication Series). New Jersey: Lea. Ledingham, John / Bruning, Stephen (Hg.) (2000): Public Relations as Relationship Management. A Relational Approach to the Study and Practice of Public Relations. Mahawah, New Jersey: LEA. Mann, Andreas (2004): Dialogmarketing. Konzeption und empirische Befunde. Wiesbaden: Deutscher Universitäts-Verlag. Ich werde jetzt hier ab und zu einen verdichteten Teil aus meiner Dissertation zur Verfügung stellen, vielleicht ist es für den einen oder die andere interessant. Heute beginne ich mit einem Ergebnis, das ja fast zu erwarten war. Ich hatte mir zunächst folgende Frage gestellt: Gibt es Zusammenhänge zwischen Nutzertypen und der Wahl eines eher monologischen oder stärker dialogorientierten (siehe DOI) Werkzeugs der Online-Kommunikation? Nutzertypen habe ich dabei an zwei Kriterien festgemacht: (a) dem Persönlichkeitsmerkmal Extraversion sowie (b) der Häufigkeit, mit der eine Person das Internet generell nutzt. (Befund 1) Für die Wahl des Grades der Dialogorientierung in der Online-Kommunikation spielt der Nutzertyp eine wichtige Rolle. Einerseits zeigte sich, dass extravertierte Personen ein höheres Ausmaß an Dialogorientierung bevorzugen als introvertierte Personen. Andererseits ist es auch von Bedeutung, wie häufig das Internet generell genutzt wird: Die Internet-Vielnutzer sind eher geneigt, Web-Dienste mit einer hohen Dialogorientierung zu verwenden.